HAVE you ever wondered, for someone who can afford to dine on lobster caviar frittata as much as the average person chows down fried chicken wings, what kind of abodes would they indulge their earnings on? Most people may imagine vast mansions by the sea, but surprisingly, the most expensive property is located closer to the sky than the sea — perhaps a reflection of modern times. In an effort to find out the most expensive properties available on the secondary market, TheEdgeProperty.com filtered and analysed 230,000 property listings in the past 12 months before shortlisting the top 10 most expensive landed and non-landed residential properties available on the local market. Topping the list is a condominium unit located at the heart of Kuala Lumpur. In fact, the top three most expensive condominiums are all situated within the aptly named Golden Triangle. 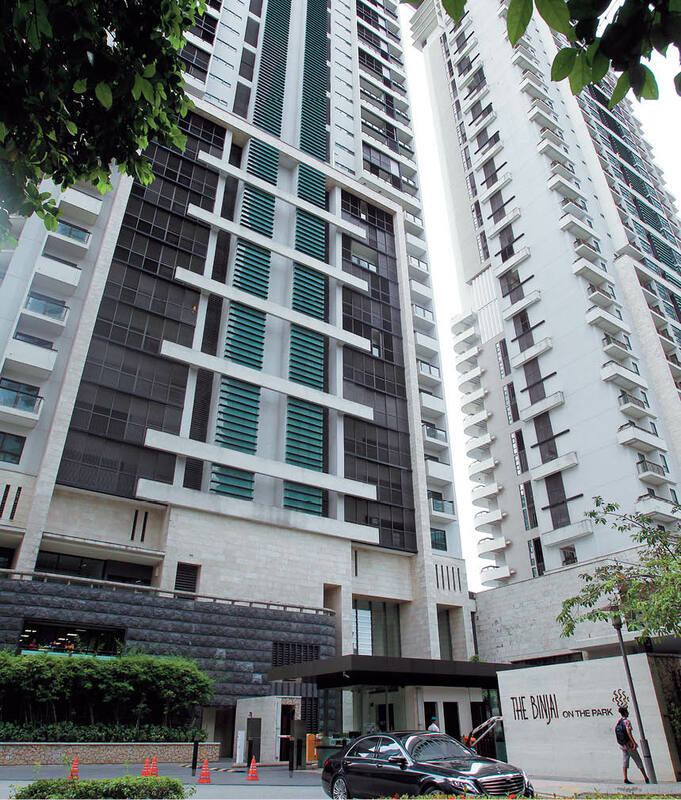 At a staggering RM50 million, the listing for a 19,180 sq ft penthouse condominium at The Binjai on The Park has surpassed even the more capacious landed properties. The project is developed by Layar Intan Sdn Bhd, a subsidiary of KLCC Holdings Bhd. The agent dubs this RM2,606 psf unit a super penthouse unit with full interior design and complete with furniture as well as kitchen equipment and cutlery. 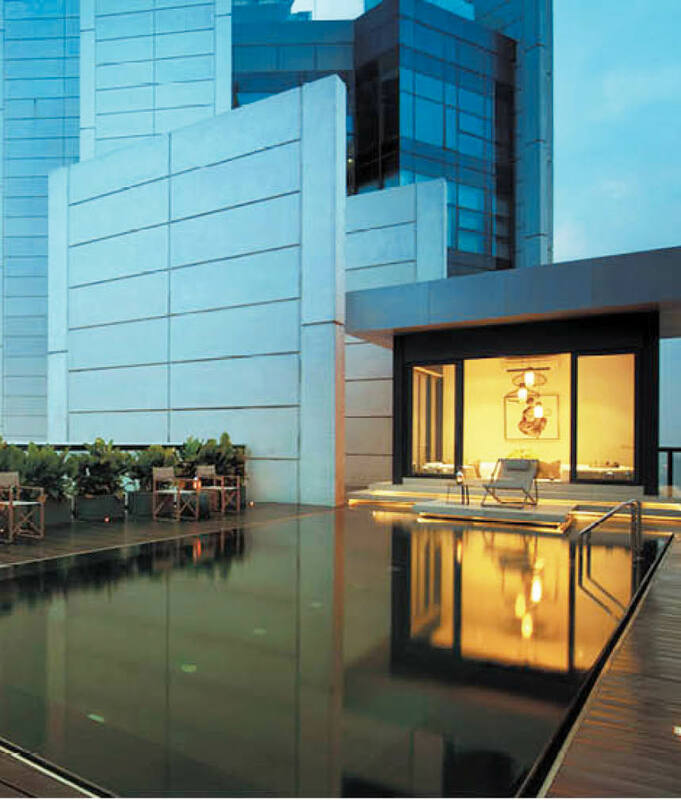 The unit spreads over four floors and boasts its own infinity pool and two private lifts — one with direct access right to the entrance of the unit on the 42nd floor and another internal one serving the unit. Besides its advantageous location next to the Kuala Lumpur Convention Centre and being merely slightly more than 1km from Suria KLCC, the vertically-advantaged unit offers unobstructed city views. The second most expensive high-rise residential property in the list is a penthouse at Pavilion Residences located in Bukit Bintang, which is asking for RM35 million, or an average of RM2,881 psf. This 12,146 sq ft fully air-conditioned penthouse comes with a 5,573 sq ft terrace, a kitchen with cooking equipment and six bedrooms as well as nine car parks. Pavilion Residences is a low-density leasehold development located on top of the Pavilion shopping mall. It offers 368 luxury residences housed in two towers, ranging between 43 and 50 storeys. 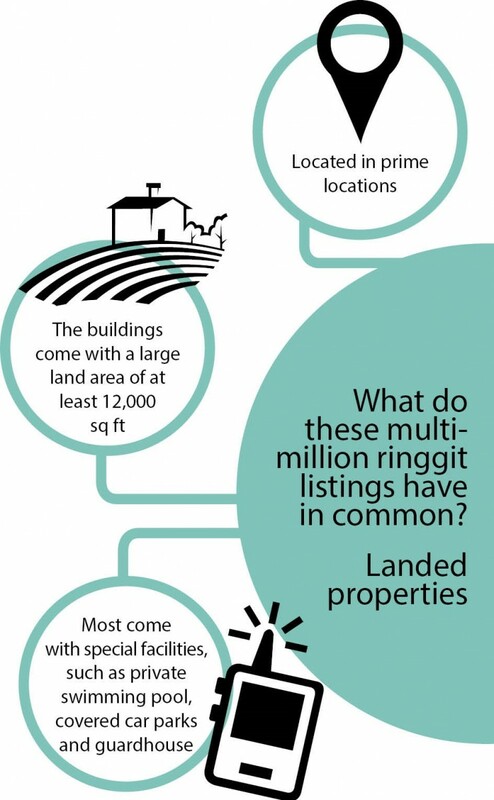 For The Troika, there are quite a number of multi-million ringgit listings. Among them, one unit comes with a price tag of RM35 million, which averages RM2,674 psf. According to the listing, this duplex fully furnished penthouse unit has a built-up size of 13,089 sq ft, consists of 4+1 bedrooms and seven bathrooms and comes with its own rooftop swimming pool. Situated along Persiaran KLCC, The Troika is about 1km away from Suria KLCC. It comprises three towers of 55, 44 and 38 storeys, housing 229 condominium units with only two units per floor. One of the standard features of The Troika is all units come with fully fitted bathrooms, kitchen hot water facility and centralised vacuum system as well as an inverter control air-conditioning system. Developed by BRDB Developments Sdn Bhd, Troika is designed by renowned architects Foster + Partners, the same architectural firm which partnered Frank Gehry to design phase 3 of the Battersea residential projects in London. Except for one, the rest of the top 10 most expensive listings are located in Kuala Lumpur, namely the KL city centre, Taman U-Thant, Ampang and Bangsar, including [email protected] Row, Suria Stonor, One Menerung, The Pearl KLCC, Serai Bangsar and Madge Mansions. All of these units are penthouses with panoramic views. Sneaking into the ninth place of the listing, the only non-Klang Valley property is a super condominium from Penang, One Tanjong at Tanjung Bungah, carrying a price tag of RM11 million. This freehold, brand new unfurnished duplex penthouse has a built-up of 18,600 sq ft. It comes with a private pool and party floor and offers six bedrooms and seven bathrooms. According to the listing, the unfurnished unit also offers a magnificent sea and hill view. One Tanjong is a beachfront luxury condominium comprising two 41-storey blocks offering a total of 147 units with only two units per floor. Some of the common features among the 10 most expensive high-rise developments include proximity to the city centre, large built-ups with panoramic views, and excellent security as well as facilities. For landed properties, the top 10 most expensive listings on TheEdgeProperty.com range between RM25 million and RM45.7 million. The most expensive house on the list is a 2-storey heritage bungalow with a built-up size of 30,000 sq ft at Jalan Lim Mah Chye in Georgetown, Penang. This over 100-year-old bungalow is located 450m away from The Heritage Club and about 4.5km away from Komtar Tower. The bungalow has an astonishing land area of 1.5 acres, and it is freehold too. The bungalow comes with five bedrooms and five bathrooms. Located on such a vast piece of land, the buyer could easily expand the built-up. The second most expensive listing is a freehold 2-storey furnished bungalow with a built up of 8,230 sq ft at Jalan Biggs in Pulau Tikus, Penang, which is asking for RM43.3 million. It is located about 500m from Colonial Penang Museum and about 2km from Gurney Drive. This vacant bungalow has a land area of 43,357 sq ft and the house comes with five bedrooms and five bathrooms. The agent, who declined to disclose his name, said it is an old bungalow purchased by the current owner three years ago on the secondary market. The third most expensive landed property is a listing offering two single-storey bungalows sharing one land title at Lorong Yap Kwan Seng, KL, which is asking for RM42 million. The freehold twin bungalows are sited on a land area of 15,000 sq ft and come with a combined number of 10 bedrooms and eight bathrooms. According to the agent, this is a rather old property of at least 10 years old. The owner has already converted the title for commercial usage. According to the listing, the property has the potential to be converted into a showroom, restaurant or embassy. Some of the houses on the same street have already been converted into car showrooms and restaurants. 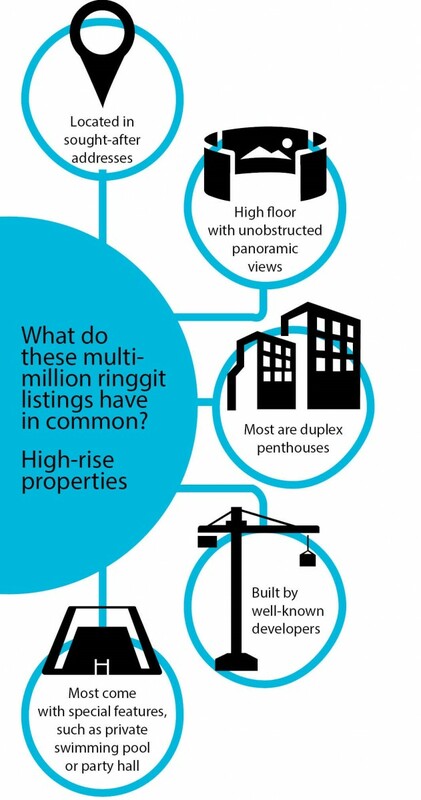 The other seven most expensive listings are from Bukit Tunku (or Kenny Hills), KL city centre, Ampang, Taman Bukit Pantai, Tropicana in Petaling Jaya and Penang. Among these listings is another two-unit bungalow situated on one plot of land at Lorong Gurney, KL, which is considered a rare deal as it is located close to KL city centre — about 4.5km away. This freehold property has a land area of 26,997 sq ft and a built-up of 19,090 sq ft. It boasts 10 bedrooms and 10 bathrooms as well as a guardhouse and two swimming pools. Another interesting listing is a two-and-a-half-storey bungalow which is situated at Taman Tun Abdul Razak, Ampang Jaya, Selangor. It has the biggest land area among the top 10 list of most expensive homes for sale, at about 1.6 acres. According to the listing, this leasehold property, tagged at RM30 million, features 11 bedrooms (including servant rooms) and 15 bathrooms as well as 17 car parks. It also comes with a swimming pool, barbecue area, main lounge, gymnasium room, two dining areas and dry and wet kitchens, as well as six store rooms. This story first appeared in TheEdgeProperty.com pullout on March 10, 2017. Download TheEdgeProperty.com pullout here for free.